In BLACK+DECKER Deck Codes & Standards, national authority on building codes, Bruce Barker, explains how to both design and build decks within legal limits. 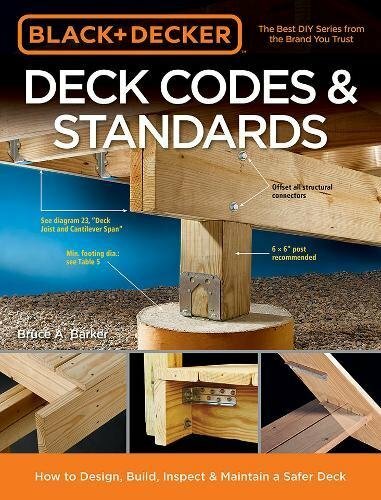 In BLACK+DECKER Deck Codes & Standards Barker accurately shows how to design and build decks right. Given that every year in the U.S. more than 120,000 people are injured by deck collapses, and more than 50 die, following Barker's careful and detailed advice is the surest way for a homeowner to protect against disaster. Barker's new book is not only for DIYers who are building a brand new deck. National deck building codes have changed significantly in the past five years: 4 x 4 posts are no longer allowed for structural purposes that a few years ago were deemed fine, and minimum diameter requirements for concrete posts have doubled in many applications. If your existing deck is more than two or three years old, you'll want this detailed but accessible volume.